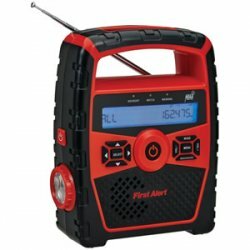 If you don't own a weather radio, consider this Portable AM/FM Weather Radio with Alarm Clock by First Alert. This portable weather radio is perfect for camping, daily travel and especially the storm shelter. It can search all 7 NOAA weather band frequencies, and, it sounds an alarm when it receives an emergency broadcast. This radio also alerts the user to the severity of the weather alert visually by illuminating one of three LED's (Advisory, Watch or Warning). This handy radio can also charge your USB compatible devices and is weather-resistant. This portable weather radio can be charged using the built-in dynamo crank power generator, the built-in solar panel, or by USB. It can also be powered using three AA batteries (not included). The solar panel is built into the top of the handle and the dynamo crank handle folds out of the back of the radio.